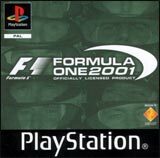 Formula One 2001 is an officially licensed formula one racing game. All tracks, teams, cars and drivers from the 2001 season are in the game and can be selected. The game features a realistic damage model and various racing modes, including championship, single race-weekend, free practice and splitscreen mode for two players. Before each race, many aspects of the car can be customised. Further features are a replay mode and race commentary by famous reporters of each language.